Money, finance and capital markets are social constructs that have ostensibly evolved for societal purpose. Yet paradoxically finance and enterprises that intentionally target social returns need to be prefixed with the word ‘social’ (sometimes ‘impact’, sometimes ‘social impact’) to make it clear that they have an explicit social purpose. Measuring social impact, and by extension environmental impact, is an attempt at quantifying the societal relevance of all this activity – and shining a light on what might be otherwise described by economists as positive or negative externalities. But measuring social impact directly is arguably one of the most difficult ways of universally assessing social usefulness. This is because not everything that is important can be easily measured, and not everything that can be measured can be easily compared with other important things because they often often get measured in different ways. This is the first in a series of exploratory essays to try better understand the conundrum that many are grappling with – to try find a universal way of describing societal impact as well as holistic returns on capital in a meaningful and comparable way. It is an attempt to elaborate a conceptual framework and useful data model for normative analysis of the full range of societal returns on capital. 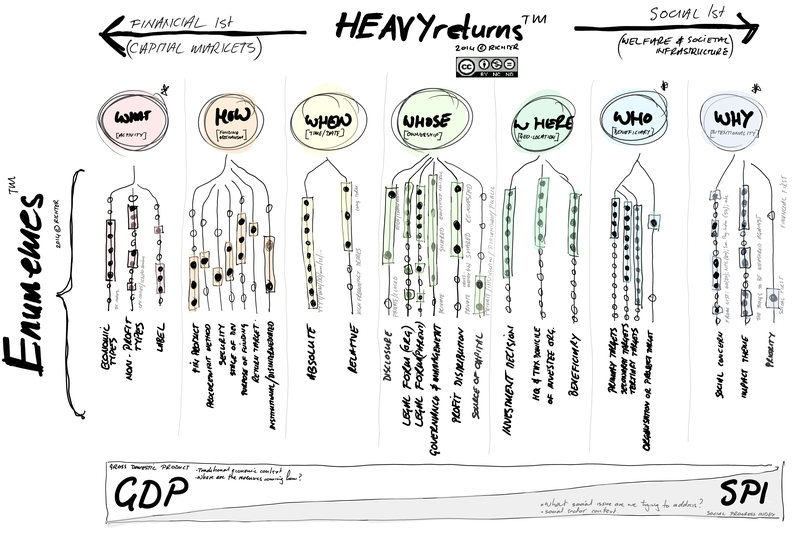 I have coined the term HEAVYreturnsTM to refer to a spectrum of indicators and overall framework that can express the full range of possible societal return on capital (The acronym derived from Holistically Enumerated and Appraised Vectors Yielding returns). Each cluster of indicators (or ‘vectors’) of return is conceptually arranged on a spectrum broadly from purely financial priority on the left to broadly social priority on the right. I have coined the term EnumemeTM to refer to each of the individual indicators within the context of the HEAVYreturnsTM framework. In this context, each EnumemeTM describes a distinct enumerative element that could be used to help assess overall performance, encompassing both financial and non-financial aspects of the holistic return spectrum. The term EnumemeTM is a portmanteau of ‘enumerated meme’ (a meme is the smallest idea or behaviour that spreads from person to person within a culture). This model tests whether EnumemesTM could potentially be used to describe the building blocks of a universal language that could be used to articulate any definition of what is meant by ‘social’ or ‘financial’ return. Each EnumemeTM is a discrete indicator that can be normalised and therefore used to filter, organise and identify relevant subsets of data according to any definition of what is meant by ‘social’ (or ‘impact’) in the context of social investment, social enterprise or impact business etc. Put another way, the goal is that any one definition of what is meant by ‘social’ or ‘impact’ could be codified using EnumemesTM, which could then be used as a filter to identify relevant datasets that correspond to the respective definition. The image above is a conceptual diagram of how the principles of HEAVYreturnsTM and EnumemesTM could be visualised. The underlying thinking was inspired by a series of discussions I had in 2014 about the pluralistic and overlapping definitions of social impact investing, including a working group meeting convened by the OECD in preparing their report to the G8. The diagram is an elaboration of these common definitional principles and is complementary to the diagram subsequently published by the OECD in 2015 (see page 44-45 of the above report). With thanks to the following people who contributed ideas or who have helped prompt and cajole thought (alphabetically): Alex Nicholls, Antonella Noya, Christine Rivera, Clara Péron, David Smith, Elizabeth Corrado, Ellinor Michel, Filippo Addarii, Francis Bernstein, Francois du Toit, Indy Johar, Iona Joy, Jeremy Nicholls, Jim Clifford OBE, Karen Wilson, Mario La Torre, Matthew Pike, Michael Green, Michael Lewkowitz, Neil Reeder, Nick Johnston, Rod Swartz, Rupert Evenett, Sam Blackie, Simon Evill , Susan Biegel, Thom Kendrick, Tris Lumley, Uli Grabenwarter… and my parents. This article and the diagram (modified 2015) are published under a Creative Commons licence (Attribution-NonCommercial-NoDerivatives 4.0 International) to stimulate debate and elicit constructive critique.